For a period of a few weeks, our family enjoyed some very special guests right outside our living room's bay window. 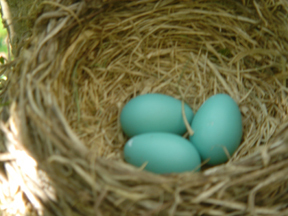 A robin bird, the official state bird of Michigan, laid a nest in our cherry blossom tree in a perfect location for viewing (both from inside and outside). 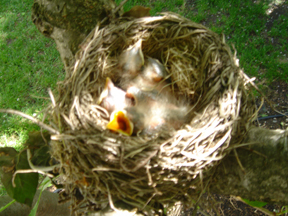 I took photos of the nest from the time she lay the eggs to the day before the three babies flew the coup. 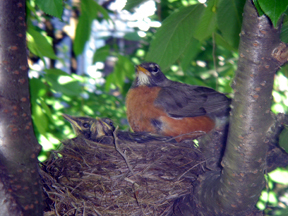 Having never known much about the Robin bird I enjoyed watching her and learning more about her species on the Web. Our family loved listening to her sing and checking up on her each day. I've uploaded some of the photos I took of this experience and will also upload some video clips soon. Enjoy!